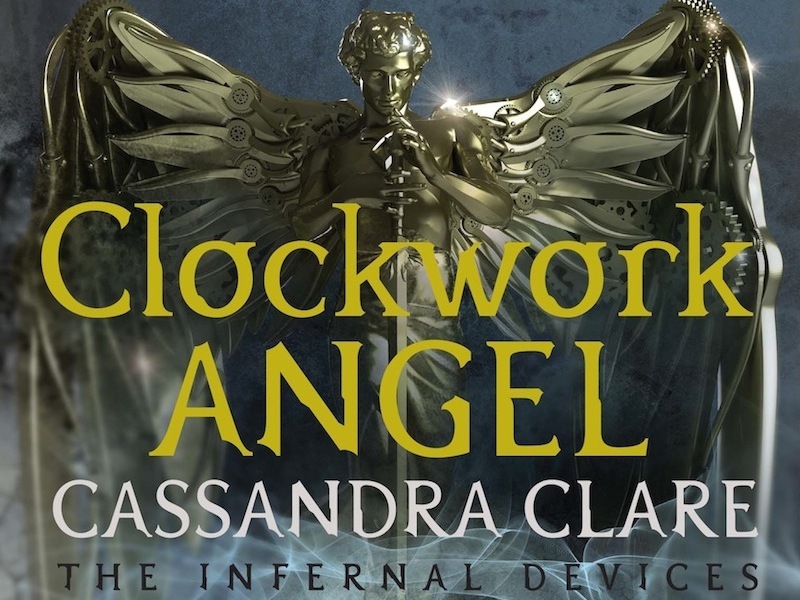 Yesterday fans of Cassandra Clare’s The Mortal Instruments were treated to the repackaged covers of books two to six and today it is time to reveal the covers of Cassie’s second Shadowhunter Chronicles series – The Infernal Devices. The repackaging of Cassandra Clare’s epic Shadowhunter novels has been a rewarding, year-long adventure. Right from the start, when Karen Wojtyla, Justin Chanda, Annie Nybo and I sat down with Cassie to discuss the new direction, I knew it was going to be something truly special. Cassie had a wonderful vision for the new-look: for the characters to be the main focus, to infuse them with a real intensity, and passion, but also keep them a little mysterious. We all wanted to give these new covers as much “heart” as possible. We commissioned the extraordinary Cliff Nielsen (who had worked on the original packaging) as the cover artist. Cliff’s work is not only beautiful in a lyrical way—but it’s edgy and bold and mesmerizing—the perfect match for Cassie’s books. I especially love the details in his work, the way he united a different rune with the featured character on each of the Mortal Instruments covers, and the way the Clockwork Angel is woven into the character on each Infernal Devices cover. I’ve always thought the best covers were those that will not only draw a new reader in, but also give that reader something else to explore after they’ve finished reading the book; when they go back and pore over all the visual details of the cover they maybe hadn’t understood, or even noticed, before reading the story. There are so many details on every part of the packaging of these books, and I really think it will keep Cassandra Clare’s fans—the new ones and the already-established-ones—engaged long after they’ve closed the books. Creating the cover to a novel is an exciting task. I get to work with really smart people (like Russell Gordon and Karen Wojtyla) that admire beauty and strive for originality. I get a chance to selfishly explore my artistic interests. I get an opportunity to be the first person to investigate and describe visually the world that sprouts from the creative heart of the author. Cassandra Clare’s stories are special because her heart is special. Her words beautifully interweave the wonder and excitement of youth with myth, cultural history and mysticism. She makes them the popular culture. So much work went into creating these covers. The process includes combining traditional mixed media painting, digital painting, photography, 3D rendering, found objects, and calligraphy. I’m passionate about these things, but the STORY is the true King. A good illustrator will understand that, above all else. Nevertheless, with this project I found myself asking “What drives the King”? What is the purpose of the story? Reimagining these covers has been an exercise in trying to capture that emotion through iconography. It has been an attempt to personally connect with these beloved characters and their fictional lives, and share it as a visual parable to the throngs of Cassandra’s fans, past present and future. I hope you experience them with as much wonder and joy as I had creating them. The new paperbacks will come complete with maps of London and a forward by me about writing the trilogy. These new paperbacks will be published on September 1. Which TID cover is your favourite? Mine is Tessa’s. They are beautiful, but I liked the other covers better. Oh man, these are gorgeous. I’m so tempted to buy them all again! They look amazing, but the other covers portrayed the characters more fairly. They’re pretty. I like Tessa. At least they don’t have “A Shadowhunters novel” on the side. I feel like buying these along with the new TMI covers. But I usually don’t buy double copies of books. Although, I might make an exception for these. When will TMI and TID be released with the new covers? It says so at the end of the article: September 1. These are excellent, but the old covers were perfect and cannot be topped. I do like how Jem has his violin…but STILL. You can’t beat the old covers for this series. However for the mortal instruments series, I do like the new covers better than the old. Right now Walker Books is only publishing new covers for TMI. Beautiful. My only criticism is I don’t like that the TID covers also say “Soon to be an ABC Family original series”. They’re not adapting TID yet. But wait. Are these the cover changes for paperback, hardcover, or both? I’m fascinated by the concept of spine art. Most covers don’t give that area much attention. I look forward to seeing the finished product in the bookstore. BTW, the e-mail link to this page gives a 404 error. You might want to check it. When that happened, I came directly to the site. Glad you still found your way here and commented. you guys got to admit that Will looks really hot on the original cover than this one, which doesn’t even come close!! !